A verre de Chablis and a bite to eat at the Pavillon de la Fontaine is not a gastronomic high, but the wine tastes good and is properly chilled and the atmosphere is incroyable. 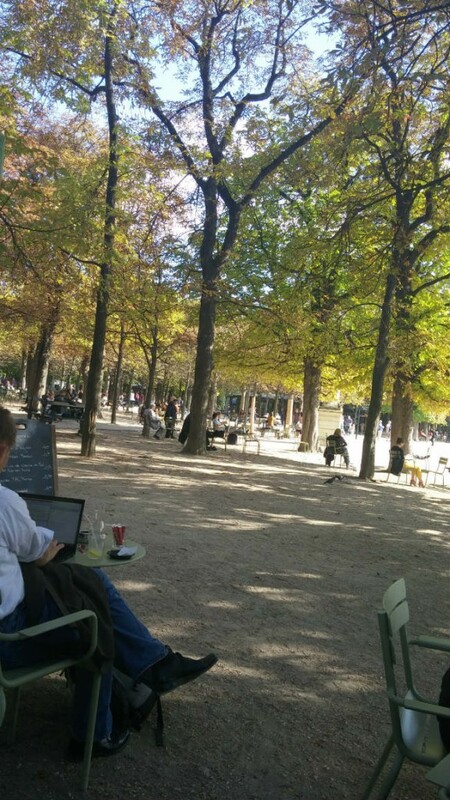 I adore sitting outside at a metal table surrounded by the sun-spackled trees in the beautiful Jardin de Luxembourg, feeling a breeze on my face as I indulge in people-watching: the folks strolling by, or engrossed in conversation, or sitting near me with a copy of Le Monde or a guidebook about Paris. 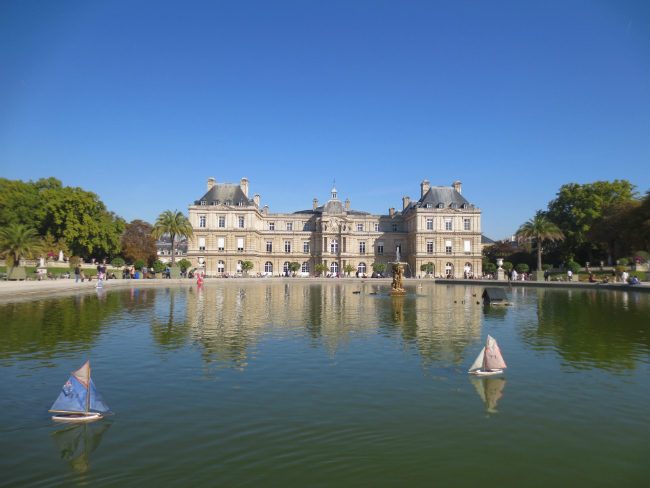 Situated in the 6th arrondissement, the Jardin du Luxembourg occupies 23 hectares (or about 1/10 square mile). It’s bounded by rue de Vaugirard on the north, Boulevard St. Michel on the east, rue Guynemer on the west, and rue Auguste Comte on the south. The Luxembourg Palace and Musée du Luxembourg both front on rue de Vaugirard. 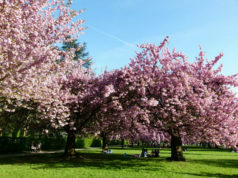 On any beautiful spring, summer or fall day, you can find folks jogging along its paths; or you can sit with the many visitors holding a book or journal in the numerous chairs and benches set near the trees or flowers or Grand Bassin or statuary. 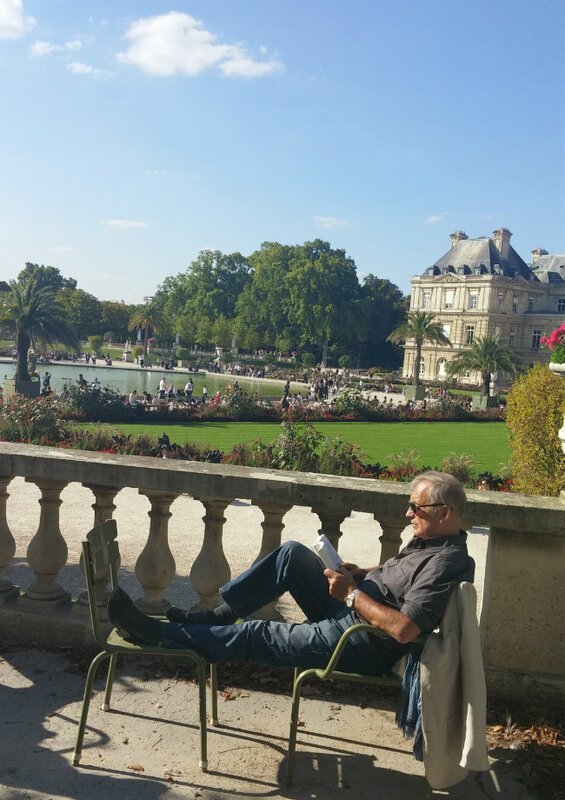 My favorite spot is one of the chairs behind the balustrade overlooking the lawns and gardens surrounding the Luxembourg Palace – which was built in the early 17th century by Marie de’ Medici – widow of France’s King Henry IV- as a residence for her and her son Louis XIII. She sought to create a garden such as she remembered as a child growing up in Florence. The Palace is now home to the French Senate, which is in charge of the Jardin and all of its services and structures. You can do what most of us do there – stroll and sit and read and stop for a drink; or you might watch the children playing in the playgrounds or riding ponies, or the ducks swimming alongside the remote control boats in the pond; or stand and admire the grotto, plane trees, and Auguste Ottin’s sculpture of Polyphemus surprising the lovers Acis and Galatea – all at the famous and imposing Medici Fountain. This is an upgraded version of the original Florentine style La Fontaine Medicis built by Marie de’ Medici in 1630. It was moved to its present location in 1864-66 after having been restored at the command of Napoleon in 1811. Or you can admire the wall fountain behind the Medici fountain – the Fontaine de Leda depicting Leda and the Swan. It is at the Medici Fountain where many famous lovers have met (including Simone de Beauvoir and Jean Paul Sartre who had their first rendez-vous there). These are the things that we all think of when we think of the Luxembourg. But if you wander more slowly and look closely you will find so much more. You can watch or play sports at the Garden. 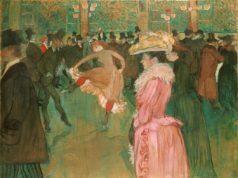 You might want to watch tennis players on the courts, or chess players on the tables on the west side of the garden, or Pétanque players in the court on the west side. You might want to play tennis there yourself. 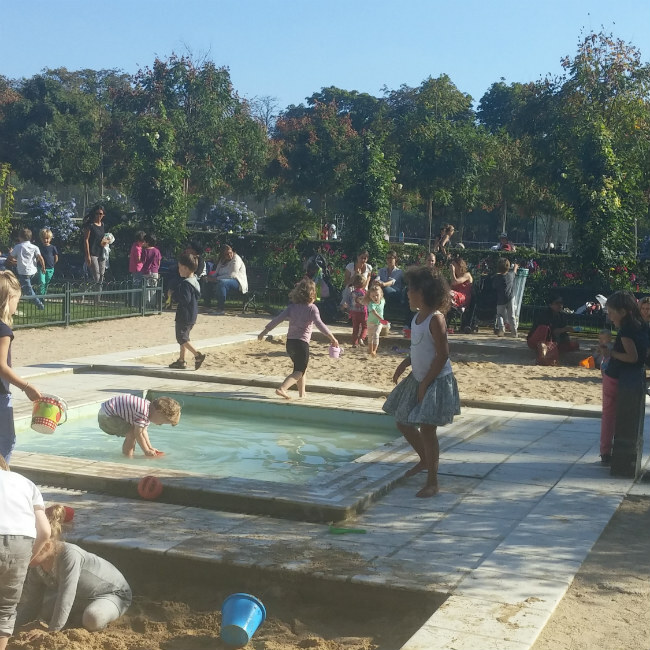 I recently found out that the courts are municipal and open to everyone – you need only sign up online and reserve your hour (at a cost of between 5 and 9 euros per hour; Tel:+33 (0)1 43 25 79 18). 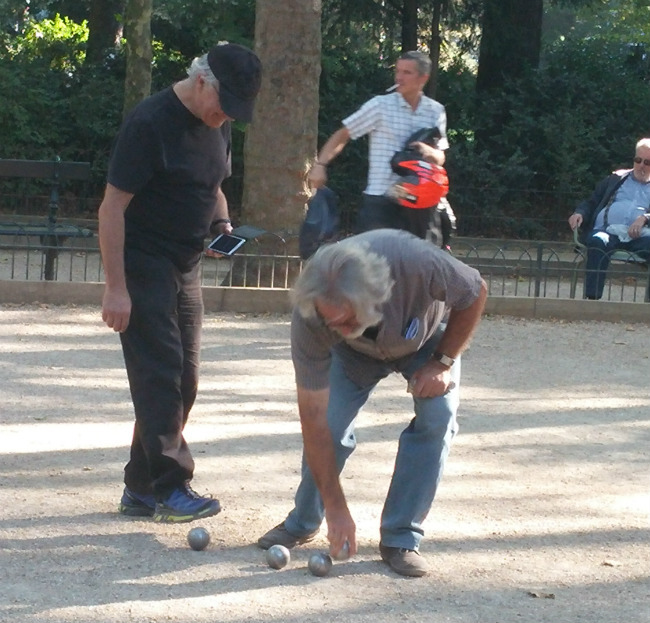 Since I could not find a site to sign up for Pétanque, I assume that joining in that sport is much more informal. It seems that the players (all French the day I wandered by) just hang up their jackets on a rack at the side of the court and wait in chairs to play. If anyone can find out more about this, please let me know. Or you can look around you to seek out and enjoy all of the garden’s surprisingly diverse sculptures – 106 sculptures in all – of all sizes, shapes, and subject matter. You might find a queen of France or other notable French woman looking down at you from a white pedestal. There are 22 of these statues, commissioned and done by various artists, starting in 1843, located on the terraces surrounding the bassin. If you stand on the south terrace above the basin and work your way around to the left, you will find Marie de’ Medici herself as the second lady on your left. You can take an “art walk” on The Senate’s website – a fascinating place to wander on your computer since it features an interactive map that locates each piece of statuary coded to category, and permits you to click on the map marker for a particular statue to see it up close with all of the information about its provenance and subject. The site also lists the categories of statuary so that you can click on any particular category (such as mythological figures or the aforesaid notable women) to see where those particular pieces are located. Yes, you can wander freely with your laptop and mouse. But I encourage you to instead follow me and wander on a beautiful day on foot, camera in hand, to appreciate the breadth and beauty of the kinds of sculptural works that are sprinkled through the garden. Some, like the ladies, are pristine and white, showing off their marble selves to glow in the sun. They found their homes here starting in 1843 and were chosen to represent women – not only French queens – who had a role in French history, or who were considered particularly virtuous or renowned. 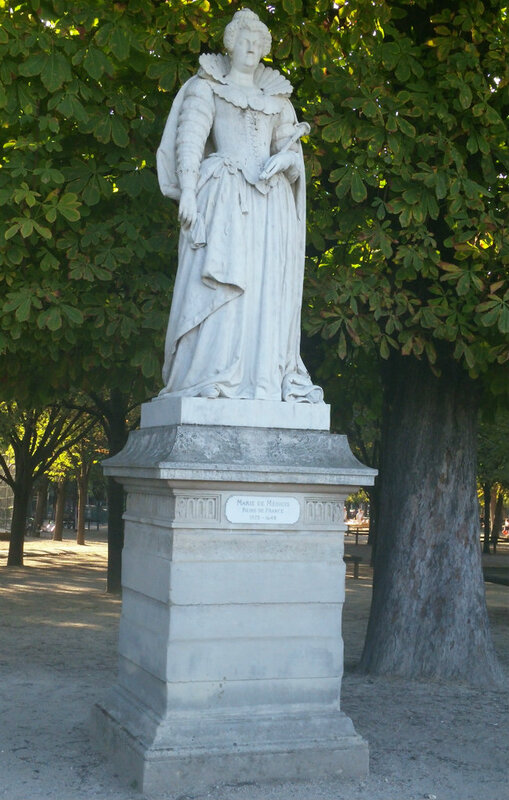 Some examples are Marguerite d’Anjou (queen of England ) – commissioned to replace Joan of Arc when her statue was moved to the Louvre in 1872; the Countess of Segur (a novelist best known for Les Malheurs de Sophie (Sophie’s misfortunes) and Saint Clothilde. They stand on the terraces circling the basin. There are also mythological figures, busts and statues of historical figures, animals, and even the small statue of Liberty, a model in reduced size made before the original was given to the U.S. (this statute is on the west side of the garden, not far from the west exit). As I walked by Ms. Liberty, there was a group of art students from Italy – judging from the conversations- drawing her. 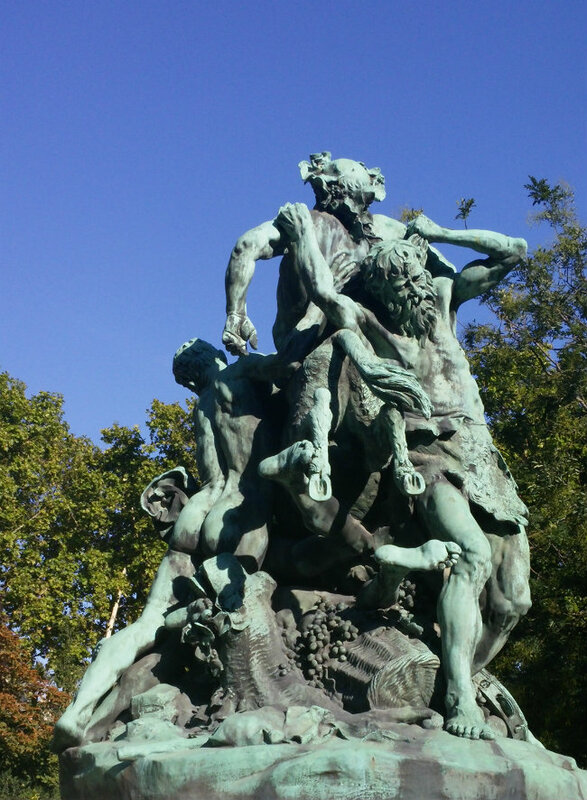 I was particularly intrigued by the large bronze sculpture, Triomphe de Silène by Jules Dalou – found in the northwest corner of the garden – which depicts the Greek mythological figure Silenus (Silène) corpulent and drunk (as always), stripped and staggering among animal and human figures, which are writhing in bacchanalian or sexual frenzy beneath him. Silène was said to be the father of Dionysus (God of the grape harvest and wine) and was said to have a gift of prophecy when in his drunken state. 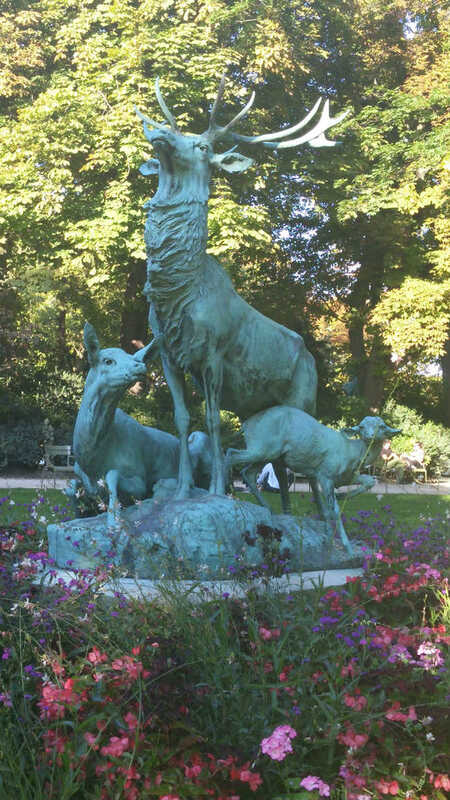 There are busts of the likes of Chopin and George Sand; a modernistic bronze sculpture by Ossip Zadkine along the south walkway (Le Poète-donated by the Zadkine museum in 1991); and animals in bronze like the Harde de Cerfs by Jacques Leduc (1891), depicting a regal male deer with full antlers standing over his doe and fawn; and the Lion de Nubie et sa Proie by Auguste Cain depicting a proud lion astride his fresh killed prey. My children are full grown but if they ever permit me to travel to Paris with a grandchild or two, I would bring them also to the garden to rent a little boat, ride a pony, watch a puppet show (there is a puppet theater on the south side), ride a vintage carousel, or play in the enclosed playground if I wanted to rest. I understand that there is a small fee for the use of that playground, but after a tiring day with kids, it is worth it. The parents and grandparents I spotted there looked happy to sit on one of the benches watching the children play. 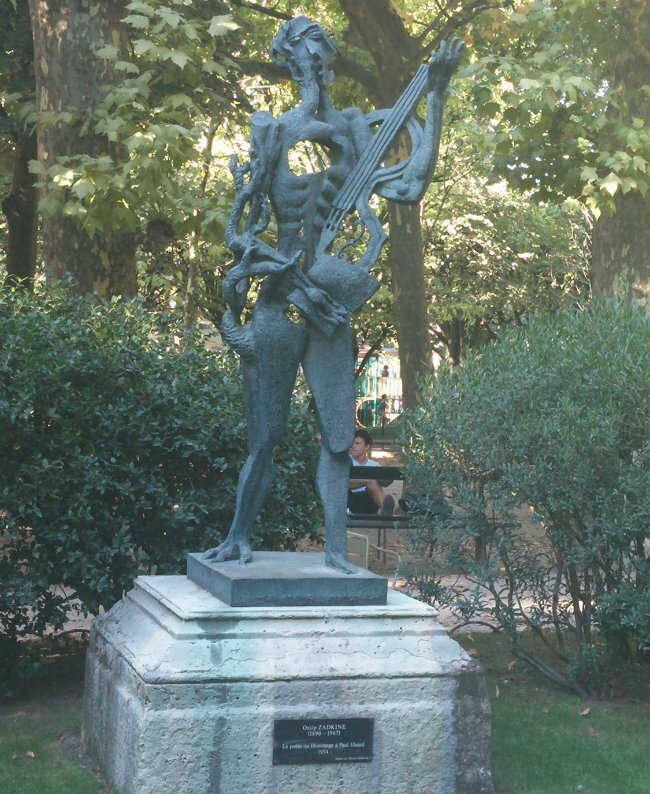 The Luxembourg Garden is also renowned for its bees. Yes, bees. 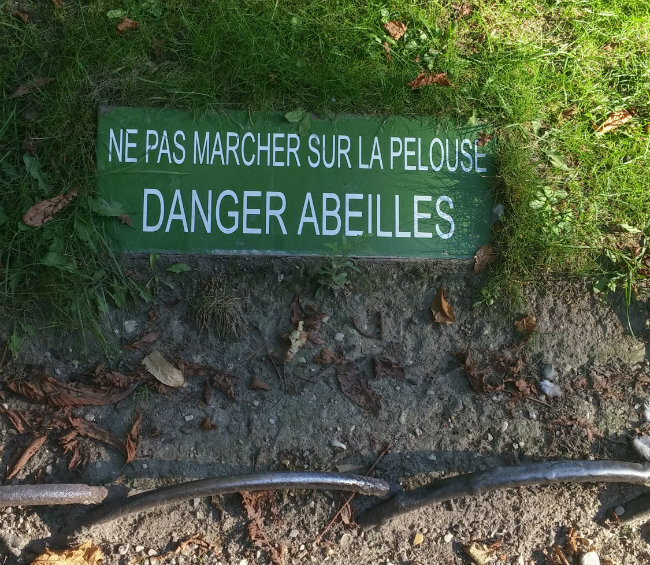 Though it is generally known that you are not to sit on the lawns in the garden, there was only one spot where a prominent sign warned me to not set foot there for fear of the “abeilles” (the bees). Yes, in the garden there is a bee house (an apiary) near the west entrance and a beekeeping school established since 1856 (the rucher école). Though there is a fear of bees dying out in many parts of the world, here at the Luxembourg the bees are healthy – living in a pesticide-free zone where the queen is replaced every 2-3 years rather than annually. They pollinate the fruit trees, and every Fall there is a honey festival (the Fête du Miel) in September. I’m afraid we have missed this year’s festival, but mark your calendar to buy honey at the Luxembourg Gardens next year. I also recently found out that the antique hives have been replaced by metal roofed modern ones situated near to the musical kiosk, where there is also a special fountain for the bees. Now I know why I had an insistent black striped visitor as I drank my wine at the Pavillon. Finally, if you are not tired at the end of experiencing all of the above, you can end your day by walking down rue d’Assas to see the works of sculptor Ossip Zadkine in the small museum that was once his studio and residence, just five minutes from the Jardin; or by walking out the west entrance and continuing a short distance on rue de Fleurus to number 25 – where you can see the building in which Gertrude Stein lived for many years with Alice B. Toklas. 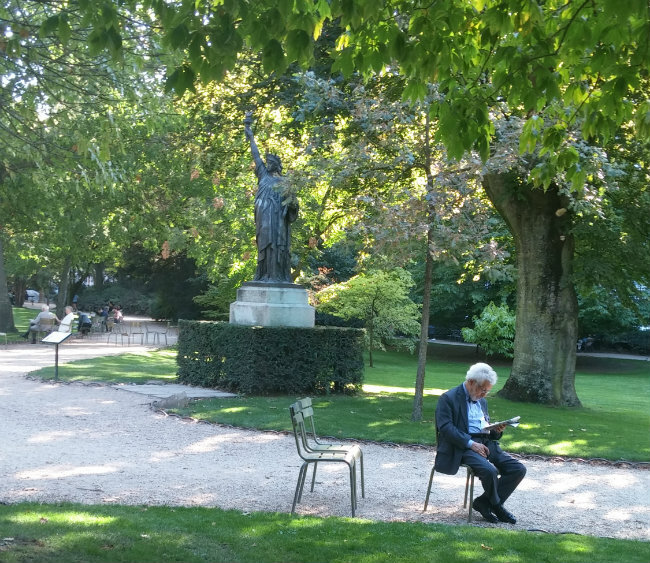 The Luxembourg Garden opens between 7:00 and 8:15 am (depending on the season) and closes between 7:00 pm and 9:30 pm (again, depending on the season). Note that the garden will be closed (or the hours will be different) for the following days: 1 January, Easter, Easter Monday, Ascension Day, 8 May, Whitsuntide, Whit Monday, 14 July, 15 August, 1 November, 11 November, 25 December . I sometimes jog or racewalk there in the early morning – along with many others – and the day I last visited (mid September) I found the toilets near the Pavillon closed by 7:45 pm and heard a whistle – then saw a man shooing everyone out the gate. 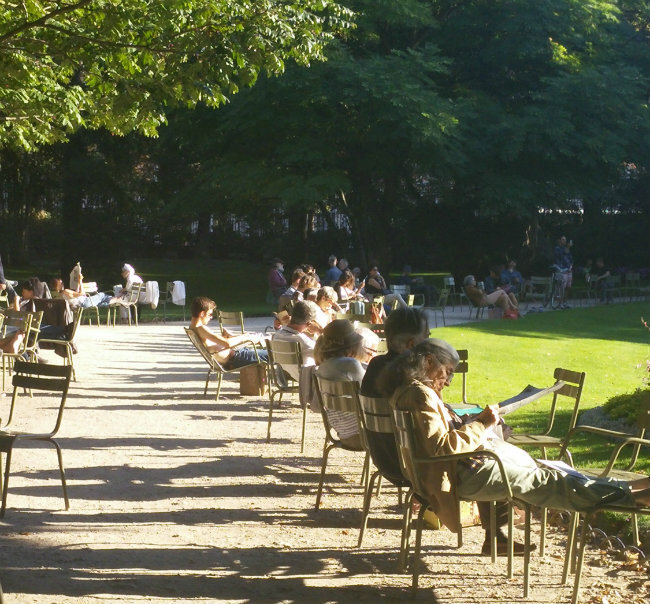 One more thing: When you visit, you should also check out the Pavillon Davioud on the west side of the Jardin, a small building that was originally a café restaurant (constructed in 1867) where there is from time to time a small and free art exposition. There was one when I visited in September. 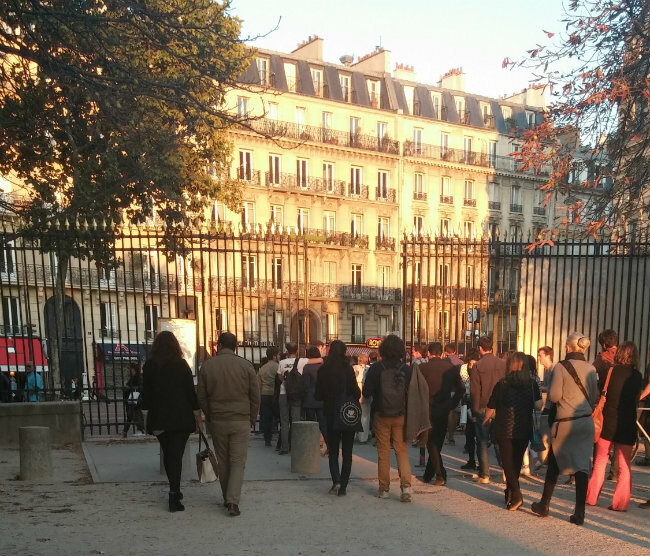 The Zadkine Museum is located at 100 bis, rue d’Assas; Except for holidays and Mondays, it is open every day from 10:00 am to 6:00 pm and except for special exhibits, there is no entry fee. How lovely to finish this beautiful article only to find that I know the author from many gatherings at home in Chicago. We clearly have a similar love of Paris and it appears we both spend as much time there as we can. 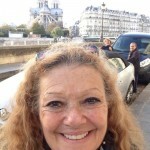 Thank you, Michele, for a wonderful guide to the jardin and your experience there. It’s a great reminder that you can see new things every time you stop in a classic place you’ve been before. 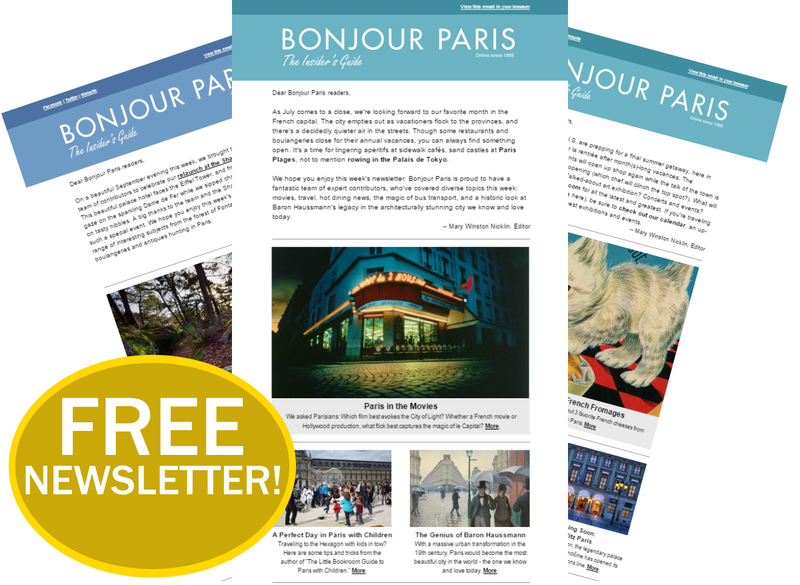 I will most certainly make it the focal point of one of the days on my next trip to Paris – next week! Just noticed thus comment about my Luxembourg article a year later. For some reason I am not notified when someine comments. So glad you enjoyed the article. I find that part if the joy I derive from experiences cones from passing it on to ithers- and I am so glad Bonjour Paris provides me that opportunity. Thank you for that lovely escape. You brought me back to my wife’s and my first stroll through the gardens that was also our first stop in Paris a few years ago. It’ll always be a favorite for us and you described the sights, sounds and feel of the place beautifully. 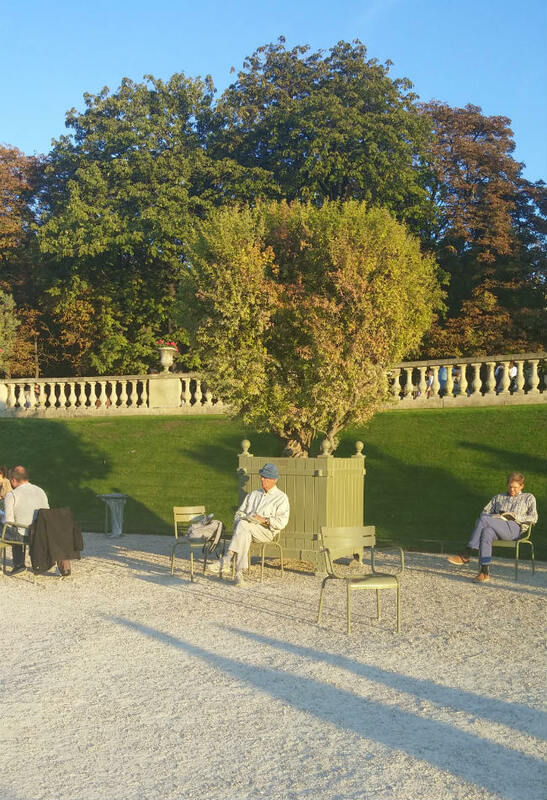 The players on the petanque courts in the Luxembourg Gardens are members of the petanque club ASL which anyone can join for 30 euros a year. For an optional additional 5 euros you can reserve a drawer in the nearby cabin in which you can leave your boules, if available. To join show up at the courts after 2pm and ask for Nardeen, fill out the forms, pay your membership fee. Only members can play on the big courts during club hours (about 2pm until closing) and teams are made up informally by 4 to 6 people who wish to play together. There are two separate courts on the side which are available to the public on a first come basis. Very well written, and full of interesting information. Makes me want to go back to Paris and visit the park! By the way, do you happen to know a reasonable (if there exists) hotel in the area?